After taking a page out of DRoberts from his thread here. I felt inspired to do just about the same! I've went forth and created a mirror image of it on my installation... granted, there's a few minor differences. In a future 'edit' to the setup, I plan, or intend to anyways, put in a cable & crank setup to make raising and lowering the pole much easier than it is right now. I've been getting a good workout on raising and lowering that pole! You're probably wondering why is the temperature and other sensors rather high off the ground... those weeds, grain, and grass on the other side of the fence (whatever gets done each year to it) gets up to 4ft and then some if it rains real good. I'd also like to put the UV and Solar sensors up on the pole as well, but unsure if there's a cable length limitation on those particular sensors. Say, that does look a little familiar. I hope you are happy with the station and mount. I know that mast of mine is likely a two person job to safely raise and lower. Good strong hardware for the Kansas climate. I thought being from Olathe that you were in the city. Us Western KS people think everything is city back there. That is a nice set up you have. Enjoy. Stealing this setup in the future! Mine took a 75mph storm recently and held up just fine. Good luck. I'm yet another one to steal this setup! I love it! I still have my anemometer mounted on top of our barn roof with a gable end mount and the separate anemometer transmitter kit, but my ISS is now mounted on a post with a Satellite dish mount just like you have used here. I really like how it puts the ISS out about half a foot away from the post itself, and it is a very solid mount. It's not going anywhere that's for sure! Our of curiosity, what are you using for a pipe to get the anemometer up that high and stable without any guy wires? Or do you have wires for support that we just can't see in the picture above? Do you have much wobble in higher winds? 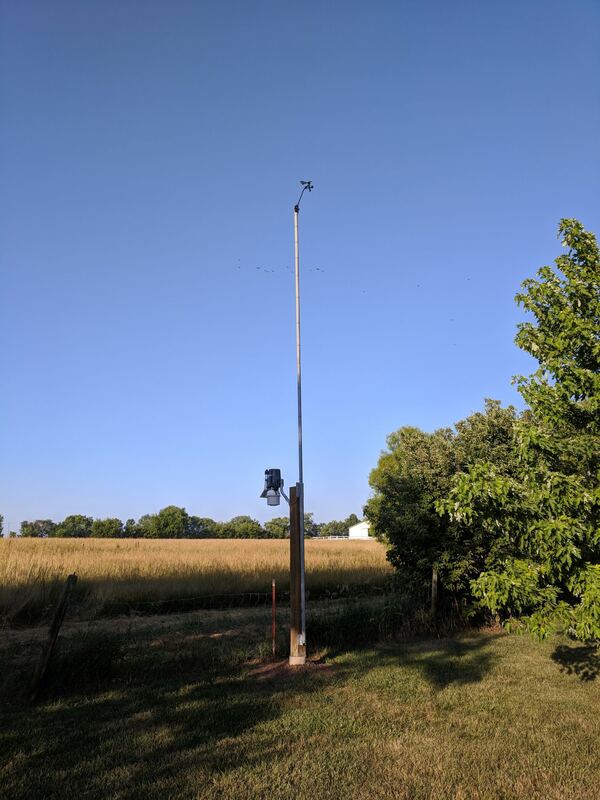 With my new ISS that I ordered on the way soon, I may set up the new anemometer just like you have pictured here while keeping the other one up on the barn, but any time I try to mount a pole that tall it is not very stable above were it leaves the support of the wooden post. I currently use 1 1/4" galvanized posts that come in 35" sections. Thanks, and beautiful setup you have there! I know that mast of mine is likely a two person job to safely raise and lower. Please explain why it is a two person job? This is not the first time I've read that here...maybe it was you who said it before on this forum....I don't remember. So I understand that there are bolts to loosen. Then the pole would be free to freely swing down, so if your hands full with a socket wrench it may be awkward. But what if you stood in front of the pole and laid your body into the pole as you loosen the bolts. Then you toss the bolts and wrench into a bin on the ground as your body is still holding up the pole. then when your free hands you grab the pole and lower it by walking it down. I'm just trying to picture the task and I can't come up with a reason to need a second person...other than you just hold the pole as you loosen bolts. I'm not saying this to be a jerk. I'm genuinely interested to hear about your experience and why you need two people. I've never done it and I don't have this setup....but if I ever upgrade to a VP2 or whatever comes next I'm interested in knowing more about mounting options and servicing procedures. I do see putting it back up a more challenging. But maybe you put the bolt and wrench in your pocket and walk the pole up. Then lean against the pole and reach your hands into your pocket to grab wrench and bolts. I suppose you could use this method too when taking it down and not need the bin on the ground. Another modification could be to add a safety catch. So you loosen the bolts and the safety catch still holds the pole up but it might be wiggly in the safety catch. Then you free your hands and release the safety catch and walk it down. Reverse to to put up. What do you think? No leaning into poles and having to reach for wrench and bolts while pole is not yet secure. Shortest answer I can come up with is this. 1. I am no spring chicken any more. 2. That galvanized pipe weighs 60 lbs (est/guess) and is a 25 foot mast. Not the same as a picking up a sack of feed. 3. When my son and I put it up, we were glad to have a set of hands to hold and a set to bolt/fasten. 4. If I drop it, I pay for a new anemometer and maybe new cable. I guess until I know for sure I can handle it alone, I will have a spare set of hands to help if something goes wrong. Be careful, whatever you do. Good feedback. Safety first. I didn't think it would weigh that much for some reason. As a side note, my temp/hum is also mounted on the mast at about 13ft high, i read a paper once that in an urban environment, mounting the temp up on the mast (below the 10m) makes little difference and can be more beneficial when in a garden thats a heat trap (like mine) and you have limited ideal locations for it. i used to read +1ºC, but now its spot on. I have also mounted the UV and Solar at/near the top, you have to extend the cable on the davis setup, easily done, but you also have to be mindful of the direction you mount them so as not to cause any shadow during sunrise/set, also be mindful of birds, i mount a OS anemometer just above and offset from the Davis equipment, this in turn gives the birds somewhere to sit and they ALWAYS sit on the OS cause its above the Davis. Just was looking at the map where you are located. Your station is set up in an agricultural environment apparently? Not too far from the coast? Interesting climate, I bet. I don't have my station guyed, but the anchor post is secure. I had a little movement with the J pipe that the ISS is mounted on, so I need to look at a solution for that. It was a 75 mph gust. My apologies for not seeing these replies. Never seem to have had any email notices. > what are you using for a pipe to get the anemometer up that high and stable without any guy wires? Schedule 40 Galv pipe. 20some ft, i want to say 25ft - don't recall the exact value this morning. There was a smidge of sway, but that was due to the ground being so dry and settling kicking in. Spending an hour getting mud and dirt mixed with water wedged into the circle-crack at the bottom resolved that issue. It's absolutely rock solid now. Only wish i had rebar reinforced it at the base. > Or do you have wires for support that we just can't see in the picture above? No wires/supports. Planning to put in a crank-tilt pulley system for the pole however. Busy with other tasks lately. Right now, takes two people to manage the pole going up and down. Gravity isn't my friend. > Do you have much wobble in higher winds? Not much, but highest wind gust so far has been 51 mph. FWIW, the wood post is about 4.5ft-ish into the ground. Another 0.25ft is gravel at the base. Used a rather large two-man auger to put that post-hole in. A good foot of that ground was flat out dry before hitting the clay and somewhat more moist dirt. I had the same problem. Check your spam folder. I fixed the notification issue by whitelisting the wxforum.net address. See your email service settings for changing the inbound rules and filtering and adding this exception. If you need more detailed help, tell me what email service you are using and I can probably give you exact directions for changing this. It's gmail, have made a filter for it. Well then... noticed last night around 4:50 in the morning the anemometer spun around real good according to the logged data, woke up this morning and found that the fin to the vane is missing. Can't even find it on the ground within 50 feet of the pole. So i assume an owl (or whatever it was) really wanted it. ...anyone know of an efficient way of fixing that without extending the pipe up and over? That would likely cause wind-drag with a somewhat incorrect reading when coming from a particular direction. Am sort of thinking of welding on a thin metal (1/4 inch) attachment that is 'rigid' so that it won't be as appetizing to land on.